I've been without my dad for just over a year. On Thursday I was getting ready to distribute some more of my dad's things, and got very involved looking at one of his collections. I enjoyed perusing his photos and his written thoughts. It made me miss him. I think I've mentioned that because of the events of the last year, I've barely had a chance to grieve my parents' loss, but the time I spent with his things the other day, was so nice. Part way through, I realized, that it was actually his birthday! He would have been 98. My dad, Bill Ransom, was a fan of all things western. A few years after my parents retired to Montana, they got caught up in the excitement of the Montana Centennial celebrations. One of those was the recreation of a cattle drive, and they joined in the fun, in their way. I think some of you, at least, may enjoy reading my dad's account of the experience, as well as his photos. He and my mom had a wonderful way of looking at things, and Dad recorded everything with 35mm photos, 16mm movies, and writings. They appreciated history, authenticity, love of country, and their beautiful Montana. I am grateful for my dad's adventuresome spirit, and my mom for being such a good sport. A prairie dog rose up from the hole in the center of his earthen mound appearing to exercise a proper amount of caution. He was soon followed by another, both quickly turning their attention directly to the north. Obviously, the two of them heard of felt something Louise and I did not. In a matter of minutes it all became quite clear as our ears began to record a muted, yet powerful, sound. I easily likened it to something of a muffled drum-roll as it swept toward us through Montana’s wild prairie grass. Hoof beats – yes, thousands of them – coming from the north. Man oh man, this was it – this is what we had waited for. A cloud of dust rising over a near distant ridge told us we had chosen a good spot to witness the greatest cattle drive in history. Perhaps the strategy of leaving our car by the highway and hiking a mile and a half away from everyone and everything “1989” would pay off photographically as well as allowing us to better take a step back in time. This was day three of Montana’s “piece de resistance” in celebration of its 100th year of statehood. This monumental undertaking gave birth to seemingly insurmountable problems in logistics, but after months of planning and using some “Old West” ingenuity, things dovetailed in time for the start. The drive had begun, appropriately, up on the Musselshell River at the town of Roundup on September 4th and would conclude on the 9th in Billings, 60 miles to the south. Louise and I grabbed for our camera gear as the first of the herd began pouring over the ridge like lava moving fast through sagebrush and grass – lava wrapped in cowhide. This first bunch was comprised entirely of longhorns, descendants of that first herd driven up from Texas in 1866 by Nelson Story and his hands. Most of these were owned by Jim Leachman and were destined to come under the auctioneer’s gavel at the Metro Arena in Billings three days hence. Both cowboys and cowgirls controlled the herd, holding their positions at point, wing and drag. Dad chatting it up with the riders. The trail boss for the drive was Jay Stovall, and as the lead group of wranglers passed by, we tried to pick him out. We knew, too, that among this group of seasoned riders was Mike Story, great, great grandson of Nelson Story, and it was a sentimental invitation to participate that had brought him to this time and place. Riding wing near the front of the herd was the youngest of the cowboys, 11 year old Shawn Hando. It may have gotten him out of school for the week, but not out of doing a comprehensive report detailing his own experiences on the drive. To make manageable this giant herd of around 3,000 head, and for safety as well as for humanitarian considerations, the cattle were purposely strung out between 3 and 4 miles. From our vantage point atop a small outcropping of rock, we could see over a mile and a half of the total herd. At one time I turned quickly to Louise and asked, “Did you hear that? Was that a gunshot?” We thought it might be someone letting go with his “45”, for many of the riders wore holstered six-guns. We heard the sharp crack again – than saw George Reed using his bullwhip as he kept the line moving steadily southward. One of the basic rules for participation in the drive was to dress in appropriate gear, as near as possible – no Adidas and no ‘visored’ caps touting “Joe’s Welding Shop” allowed. Louise and I continued to look for photographic “targets of opportunity,” shooting both movie film and stills until the last of the cattle had passed, the last two riders carrying the American and official Montana Centennial flags, signaling the tail end of the herd. There had been intermittent clouds of dust, and now, as soon as it drifted away, we could catch our breath and enjoy our lunch which we had earlier stashed into a small backpack. We decided this was a great place for our lunch break, for it seemed, in a way, like we were 100 miles from nowhere. It was so quiet now, and luck had provided a nice setting. We had some natural rock shelves to sit on, and being almost brick red, they made a sharp contrast to the subtle golden colors of the prairie grass. Behind us were a few scrub cedars while right in front of us were several bunches of late blooming wildflowers (Phacelia) and a couple of stalks of plains yucca. The latter being an often used detail on the canvases of famous Montana artist, C. M. Russell. Overhead the ‘big sky’ was still filled with gray clouds, and with the sun trying to burst through, we could see the storm threat of the night before was truly in retreat. What a nice Godsend, for when we had visited the trail drive night camp the past evening, we had found some dramatic and ominous weather conditions. While we munched away, we reminisced about the previous night. This had been their second night camp, and we had driven north out of Billings 30 miles to locate it. We were dumbfounded to discover it spread over such a huge area on part of the Thirty Mile Ranch. We parked near the south end a bit off the highway among a collection of sage, cactus, grass, and only God knew the rest, but it was worth it. Using what expertise I could recall, I showed Louise the proper way to get through the barbed wire. Then, by revealing our most pleasant smiles, we were invited to enter the roped off section surrounding the first circle of about 14 wagons. We found an intense effort under way to get all the members of this group fed quickly as the projected storm became more of a threat. AS the wind picked up, a few horses wandered nervously away from the remuda (spare mounts) and into the circle of wagons. One beautiful pinto was whinnying and almost trampled a pitched sleeping tent, and that was enough for several wranglers to leave the chow line and haze them back to the rest of their kind. I would say there were at least 150 horses in that bunch alone, and none were corralled. The clouds darkened, and there was flapping canvas everywhere – the dusters some of the men wore – the wagon covers – and all the sleeping tents were alive in that chilling wind. I wondered how well everyone would sleep on this night. We eased over to the chuck wagon and found three gals about ready to load up the plates of both hungry cowhands and others belonging to this circle wagons. There was a tall stack of plates, a huge coffee pot, and many cups - all in gray enamel. In fact, all the utensils looked very “western.” The only thing I saw that seemed out of place was a large tub filled with chopped mixed greens – obviously, the salad. Something smelled divine coming from the open grill, and I just had to ask one of the gals what the main course was, and she replied by holding up an oversized steak – and out came one word, “Buffalo!” Now, why didn’t I expect something like that? Some questions came to mind. Things like, “How could each of the participants get his own horses back, his own cattle claimed if they didn’t go to market, his wagon returned to the ranch?” There was over 15 million dollars’ worth of equipment and horses laying out there before us. But more than all this – what is there about this segment of Americana – western Americana, especially, that had inspired so many to spend so much to come so far to be a part of all this? It was time we headed back to Billings, for by now the aroma of buffalo steaks had gotten our own stomachs to growling. We picked our way down the slope past tons of hay scattered out for both horse and cow. Most of it now being consumed as we carefully passed by. We noticed most of the cattle had individual brands, but also carried the temporary “M over 89” centennial brand, as well. This would turn out to be the longest trek of the drive; 18 miles, and over the most variable terrain, as it had a combination of being partly highway, partly prairie, much of it through the lower elevations of the Bull Mountains with their tight ravines. Were we ever glad we had decided to take in one of the night camps! As we finished up our lunch of tuna sandwiches, olives and potato chips, we considered it nearly a crumb compared to the projected amounts of food the participants of the drive would require. Such a grocery list as follows: On Wednesday, Yellowstone Kelly’s Catering of Billings planned to serve 1200 pounds of baron of beef and half a ton of baked beans to their section of 1500 people. 300-500 gallons of coffee per day. Monday night (first camp) this group ate 3,000 pounds of beef ribs. That’s equal to four head of cattle on the hoof. Bob Hurd, lead cook of Chuck Wagon Catering out of Red Lodge, Montana even revealed his own recipe for biscuits and gravy. Now, just for once, forget the calories, and copy it down for some nice Sunday morning when you’re glad to be alive – then eat hearty! Fry up an even mix of both pork sausage and diced ham. Then thicken it with a riux of butter and flour. Add some real cream along with a little milk. The cream smooths out the gravy, which is the secret to his successful breakfast of biscuits and gravy. Corn sliced off the cob, wieners and polish sausage cut into chunks, sliced cabbage, small unpeeled whole potatoes, sliced carrots and beer. Into the pot with the lot – bring it to a boil and simmer for an hour. 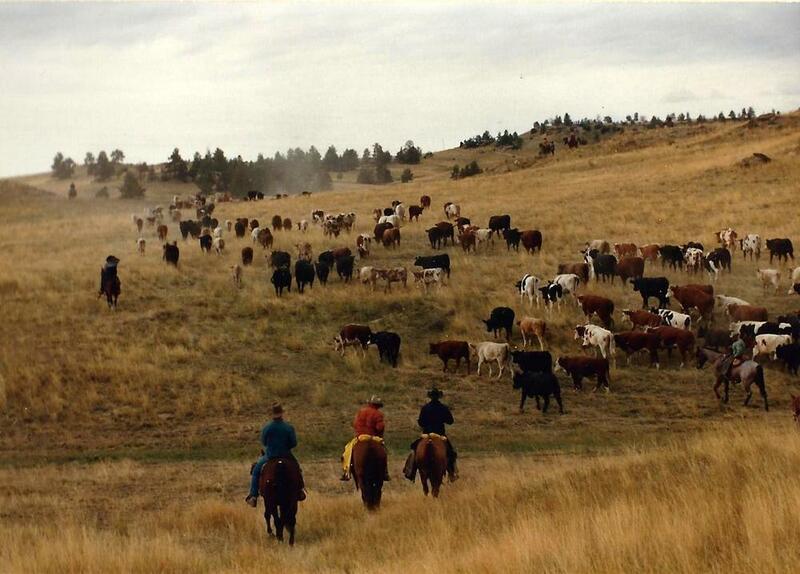 On the cattle drives of a hundred years ago – they should have it so good. Oh, gosh! Enough of that! We had to get ourselves off our rock seats and hike up another mile to where out tiny map (cut out of the Billings Gazette) showed the long line of wagons would be traveling through this section. By the time we reached the place that seemed best for pictures, 20 or 30 wagons had already passed, but that was O. K. because we still had around 300 more to go. By now, I realized I could have used more movie film to properly cover the seemingly endless wagon train, but I cranked up the camera while Louise began to shoot stills. We were getting more sun now, and grateful the weather front had swung into Canada. As the riders and wagons rolled past us, we heard everything from “Why, Hello, there!” to “Hi, y’all!” Even “How did you two get clear out here?” “Nutty, I guess,” was all I could think of at the moment. From time to time the train would stop for a few minutes – once, because one of the wagons being double-teamed up a steep slope had turned over and there was an injury through not serious. During these short delays we had fun meeting both outriders on horseback and those along with the wagon ride. We were never disappointed in how everyone was dressed. Most fit the part perfectly, women wearing long frontier dresses, sun bonnets, leather boots, etc. Many of the dresses were hand-made just for the drive, and many children had made their dresses as school projects. Behind the reins, the men wore traditional felt hats, Levis, leather vests, etc. They came from every state, and many foreign countries too numerous to mention. The wagons, surreys, stage coaches, and chuck wagons were pulled by breeds of horses from Arabians, to Paints, Clydesdales to Belgians, and Tennessee Walkers to mules. Two, four – up to ten horse hitches pulled them to each night camp. As for the riders on horseback, it was pretty much like bringing their own pet. If so, then these pets were worth maybe $1500 to $2000 each, and they really showed it. I found it rather amazing, as I had to face the fact that there was such a varied cross-section of citizenry passing by me. I mean some were “for real” wranglers, but others were seniors, doctors, ranchers, college professors or teachers, and many youngsters – well, you get the idea. I was soon out of movie film except for a few feet to cover the arrival of the cattle in Billings, so I helped Louise finish up the 35mm pictures, and then we crossed back through the string of wagons, picking our way down the long slope to our car that now seemed at least beyond the horizon. After a few minutes of working our way through the sage, we passed underneath several pine trees that had dropped an array of perfect pine cones. We thought of collecting some, but figured we had our hands full, so those will not become a part of our Christmas wreath. We were next going down a long shallow draw, and I presented Louise the scenario of someone lost and in this same coulee, and wondering what they might think if they just climbed up the 20 or 30 feet to peer over the rim and suddenly see all those wagons, men and horses stretched out for miles. What an episode for Twilight Zone! Had I, myself, lived a time warp the last few hours? Had my folks given me a dime so I could go to the Saturday matinee to watch Tom Mix or Hoot Gibson or Ken Maynard in one of so many westerns I lived to see at a cost of mowing the lawn? Anyway, the difference was certainly in “living color,” and we felt the rewards were worth whatever our efforts had been. In passing by our earlier lunch spot, we also walked near the prairie dog mound. It didn’t seem any the worse for wear, but the occupants were nowhere to be seen. I think they were deep down in their burrow, still wondering what in the world all the commotion was about. I’m sure of one thing – they’d never forget it. Would we?